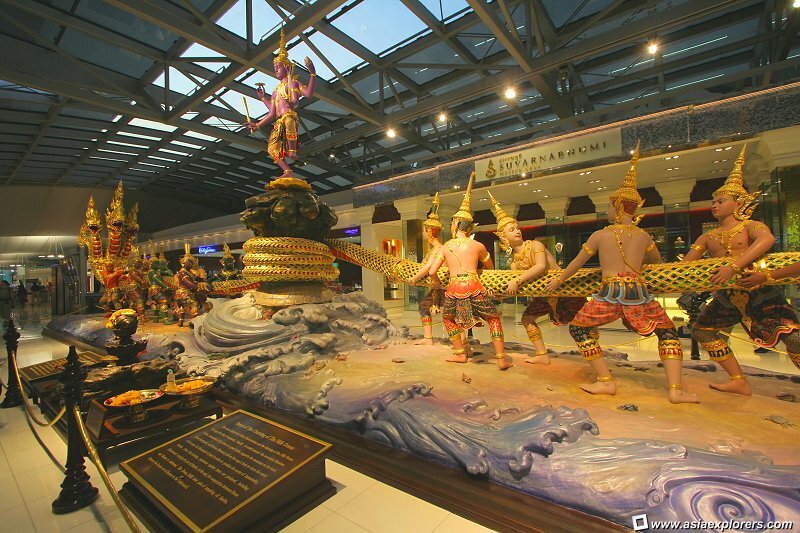 If you've ever departed from the new Bangkok airport - Suvarnabhumi Airport, you will be greeted by an impressive statue the moment you clear immigration. The statue depicts one of the famous scenes from Puranas (Hindu literature) — Samudra manthan (Devanagari: समुद्र मंथन) aka the churning of the ocean of milk. This story is celebrated in a major way every twelve years in the festival known as Kumbha Mela. Mahavishnu dancing on top of the serpent adisesha. The Churning of the ocean of milk tells of the story where Asuras and Devas (Celestial Beings) cooperated to churn the sea for thousands of years in order to extract the elixir of immortality, coveted by both groups. As you can see from the pictures, the Devas are engaged in a tug of war with the Asuras. Each team is holding onto one end of the king of serpent - Vasuki (aka Naga). The center of the serpent is coiled around Mt. Mandara (which is a pivot) and at the base of this pivot would be Vishnu, incarnated as a huge turtle. As the ocean churned, a deadly poison known as halahala emerged. Shiva drank this poison and his wife stopped it in his throat with her hands, causing the throat to turn blue. (explaining why Shiva is sometimes called Nīlakantha meaning Blue Throat). From the churning, numerous opulent things were also produced including Dhanvantari (Heavenly Physician) carrying the pot of Amrita - the heavenly nectar of immortality. In the end, the cooperation between Devas and Asuras was shattered with Vishnu taking the form of Mohini — a beautiful and enchanting damsel who served to distract the Asuras while distributing the nectar to the Devas. (a little cheating and deception seems to be happening here). The Devas having fulfilled their plan of acquring all the Amrita banished the Asuras out of Heaven and into the underworld.